I was interested in this sim when I heard Paradox Interactive was going to be publishing it. 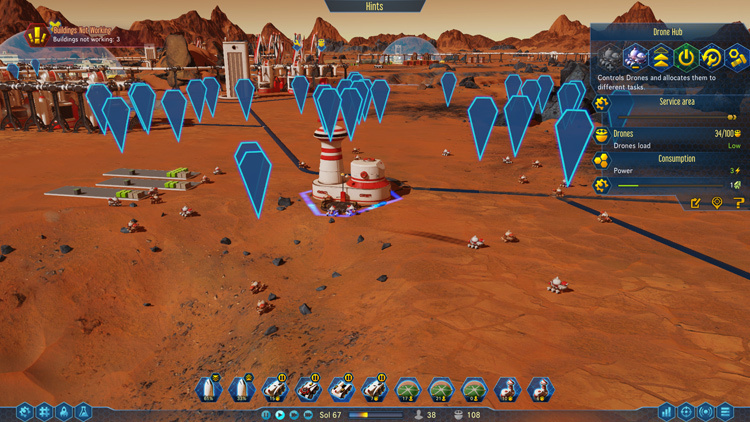 The modern day version of Sim City, "Cities Skylines" they published was quite good to play so this new premise of colonising Mars sounded like it'd be even more fun, despite being a different developer making it. 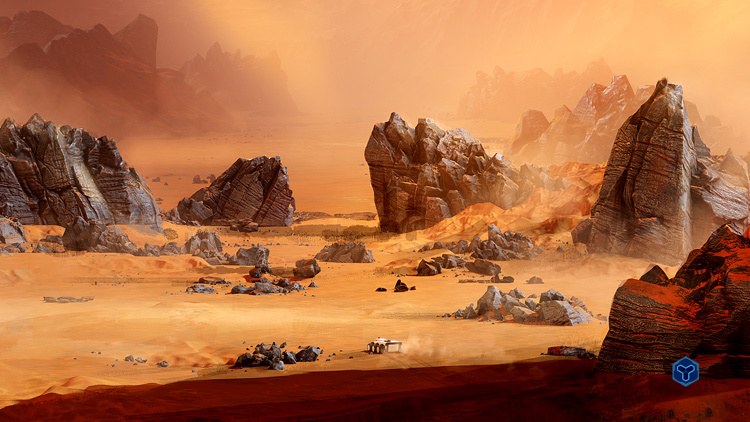 The premise isn't really that far-fetched since NASA is already simulating Mars-like environments such as the HI-SEAS programme to find ways of living on the red planet. 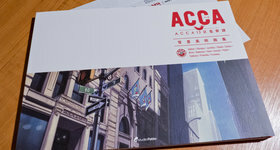 This review is based on the original version of the game before the "Opportunity" and "Curiosity" updates. 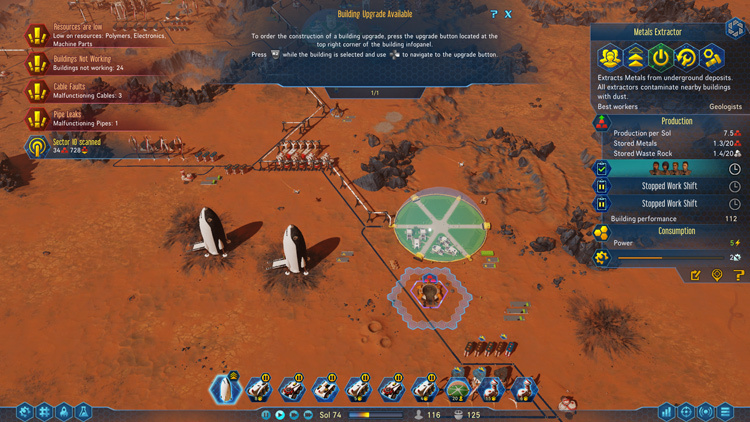 So after picking a spot to start off your colony on Mars, you land a rocket and start to build your base. Difference between this and Sim City of course is there isn't any oxygen so that becomes a basic resource you need to setup. Most of the time you won't even have a source of water nearby so there's a bit of race trying to find some by scanning the planet or, setup a vapouriser to get some from the atmosphere. The main challenge is really learning what you import from Earth since raw resources such as metal start off really scarce just like water. Your funds sets a very low limit on what you can import and the rockets take a long time to arrive. Not only that, if you don't fuel them with water so that you can send them back to Earth you run out of rockets to import with too! This alone already needs a fair bit of planning. 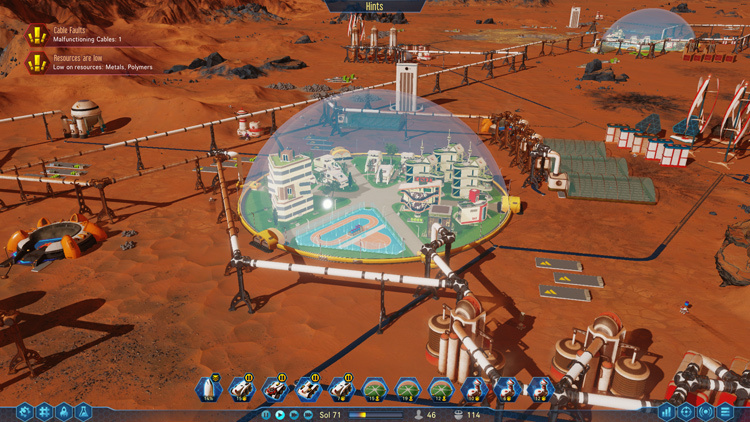 Once all the basic resources are established, you can start building domes that house your new colonists which brings the game to the next level since you need to manage their needs too other than maintaining resources. Note: The third "Curiosity" update adds a new overview bar so you don't need to keep the window open any more. Your workforce consists mainly of automated drones that must be within range of Drone Hubs - basically control towers that send out automate them. The only way of assigning them so far is by clicking them one by one. You can't actually drag a box around them or view a big list of idle drones to re-assign them to a new tower. Only workaround players have found is disassembling them at one tower and then re-assembling them the way at the new tower. Next, you have the problem of resource management. Most of the time you'd find buildings aren't being constructed or maintained because the drones don't have access to certain resources so, you need to transfer them from somewhere to a depot they have access to. However, the game doesn't show any symbols about where the resources are currently held so you have to click depot after depot to find out where they are. Shuttle hubs help minimise this micro management but sometimes they're just too slow to move resources around. Despite the "Spirit" and "Opportunity" updates, the UI still lacks a lot to be desired. Brushing aside the UI problems, mysteries (whether good or bad) add a fun and challenging alien twist to each playthrough that you might expect from a sci-fi game. It can be a very hard game. 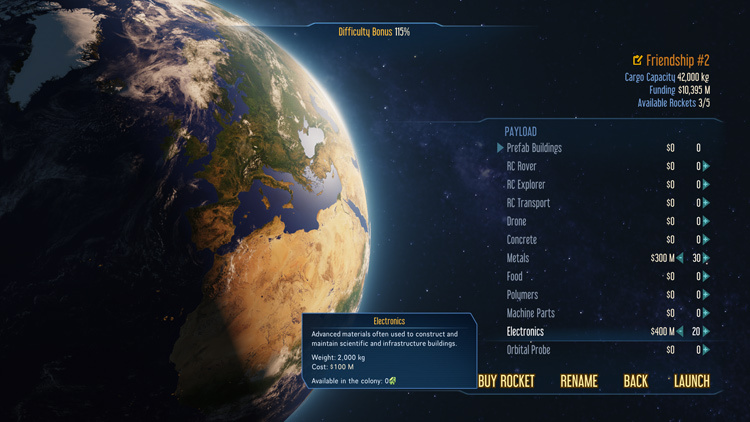 Just a simple meteor storm can cause so much damage there's simply just no way of recovering from it if it just happens to hit your settlement when you don't have the means to protect it or the resources to keep it repaired. Presentation wise, it's as clean and modern looking as Cities: Skylines which is a good thing because it's not very demanding on the graphics card. The fan on my Geforce GTX 780 Ti doesn't spin-up at all even on "ultra" settings running at Full HD resolution. Paradox had some fun making the rockets look like sharks and the drones look like little bugs with eyes on them. And, it's always fun to zoom in on your sim to view the hustle and bustle. 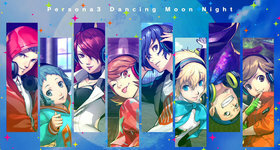 Background music is simple and goes along with the (mostly) autonomous gameplay management well. Instead of a music setting it appears as a "radio" and there is some fun older style music that kind of matches those vintage sci-fi space movie poster art. 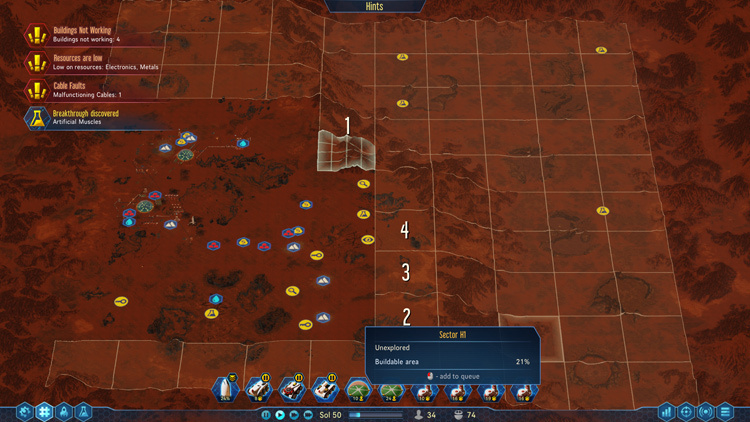 Surviving Mars has the potential to be a great management sim once it smooths out its UI design more so that managing isn't as much as a chore. 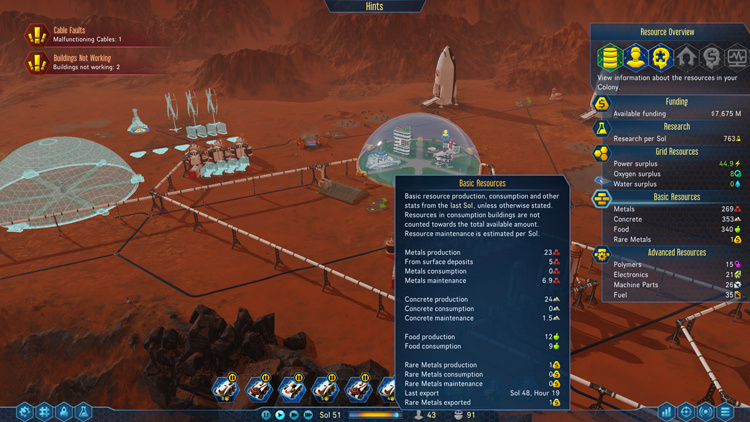 It's more challenging than Sim City keeping the resources sustained because those resources are extremely limited and you're often hit with disasters such as meteor storms. Yet, it's because of that challenge you might find yourself replaying the game so that you figure out better ways of expanding til you hit that satisfying final milestone. Fun new premise exploring the idea of colonising Mars one day. Fun mysteries add a twist to the alien setting. Looks fairly good just like Cities: Skylines. Management could be easier with a better UI. No lists for overviewing and managing places that are lacking/under-performing. No easy way of re-assigning drones between hubs. No easy overview of which depots resources are currently located. Manual review of colonists doesn't summarise how many of each type of specialist are selected.